The Advanced Stage 2- Home-Office-EMF-RF Detection Kit contains the Gigahertz Solutions ME3840B EMF Meter and the HF38B RF Meterand is considered our advanced intermediate EMF test kit. This EMF test kit is an upgrade to our MK20 EMF Detection Kit but is still easy to use and offers more advanced detection features. 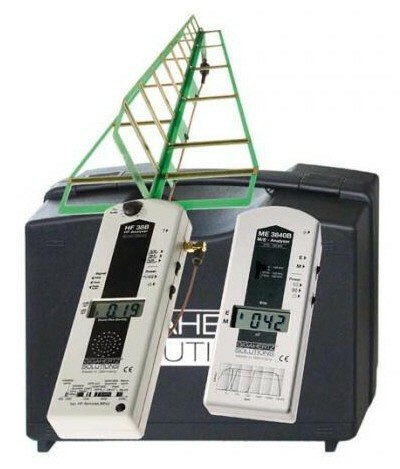 The ME3840B EMF analyzer(analyser) offers a frequency filter which allows you to determine the frequency range of your lower frequencypower line EMF. The HF38B brings a peak hold feature, a higher onboard power level scale and greater sensitivity to the table. It is ideal for measuring smart meters. Expand your EMR detection capabilities with this convenient, portable EMR detection kit.